PHOENIX- The U.S.Hispanic Chamber of Commerce’s “Guac the Vote” campaign is registering voters at taco trucks across the country and encouraging voters to show up on election day. “This is a ‘si se puede’ moment for our people, for America, for everybody to rise up and to put bigotry where it belongs.” Said Michael Reyes, owner of the La Paz taco truck. The comment prompted a backlash on social media and effort to use the comment to motivate Latinos to vote. Reyes is partnering with Promise Arizona to help register people who come to his truck location. “It’s really sad for a Chicano, Latin American, Mexican American, to speak so poorly of his own people, to speak so poorly of a very honest business that’s a real business.” said Reyes. The taco trucks on every corner comment sparked a backlash on social media and call to action. The U.S. Hispanic Chamber of Commerce created the “Guac the Vote” Facebook page in response. ” This is just the beauty of social media. Some taco trucks have started registering voters.” said Albert Morales, Vice president Government affairs at the US Hispanic Chamber of Commerce in Washington D.C. Lunch time customers were amused by the warning about taco trucks on every corner. “It’s not really a bad thing man, because people need to eat. You know?” said ET Rivera, a customer ordering at the La Paz taco truck. “As far as taco trucks go, I’m pretty happy with the taco trucks. 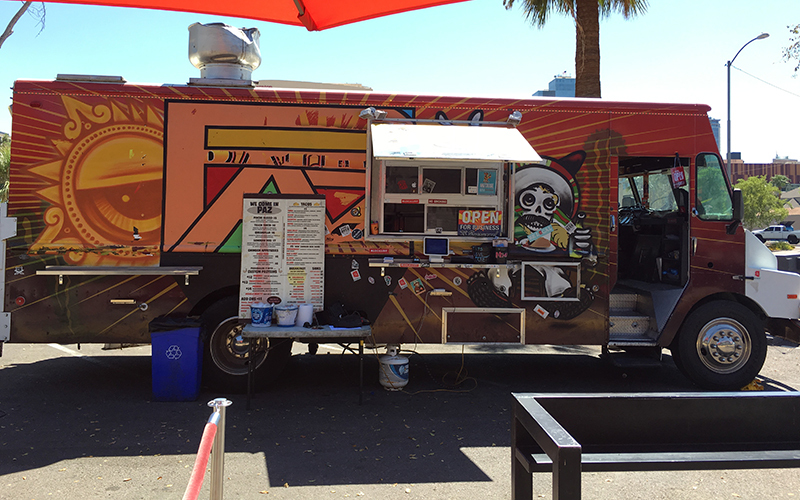 I’m cool with one being on every corner.” Said Johnny Roeckner, a customer having lunch at the “Frontera” taco truck. The Frontera truck owner questioned whether the warning about taco trucks on every corner was even valid. “In the first place city regulations do not allow for that to happen. There are rules on where you can park a food truck,” said Donaciano Nuñez. The U.S. Hispanic Chamber of Commerce is also urging taco trucks to park near polling places on election day to feed hungry voters who may have to wait in line to cast ballots. “We anticipate long lines and last thing we want is for people to get discouraged and walk away,” said Morales.